Anybody who was a child in the 1960s will remember the classic mini-hardback Ladybird books, which throughout that decade were priced at half a crown (two shillings and six pence or 12 ½ pence). The “Adventure from History” series (Ladybird 561) ran to fifty books and told the stories of such notables as William the Conqueror, Queen Elizabeth I, Christopher Columbus, Captain Cook, and Florence Nightingale. The first book, “King Alfred the Great“, was published in 1956; the last, featuring William Shakespeare, appeared in 1981. The series continues to attract great interest to this day, often bought second hand by parents for their children to provide an easy introduction to different periods of history. “Stone Age Man in Britain” was one of many titles I remember from my childhood, and when I saw this copy on a market stall I couldn’t resist paying a tenner for it. “Stone Age Man in Britain” was first published in 1961, though this copy appears to date to around 1970. My original copy featured the cover artwork on a dustjacket; this reprint has it printed directly onto the hard cover. The price is quoted in decimal as well as the old pounds, shillings, and pence – but the long-standing 2/6 | 12 ½ p has been overprinted with a ‘revised price’ of 15 p as the first effects of the inflation that became so rampant in the 1970s began to make themselves felt. I was interested to see how the book held up against what we know now. The answer, sadly, is not well at all. Indeed, it is not even a fair reflection of what was known in 1961. “Stone Age Man in Britain” would make a very poor introduction to any present-day child interested in the prehistory of Britain. 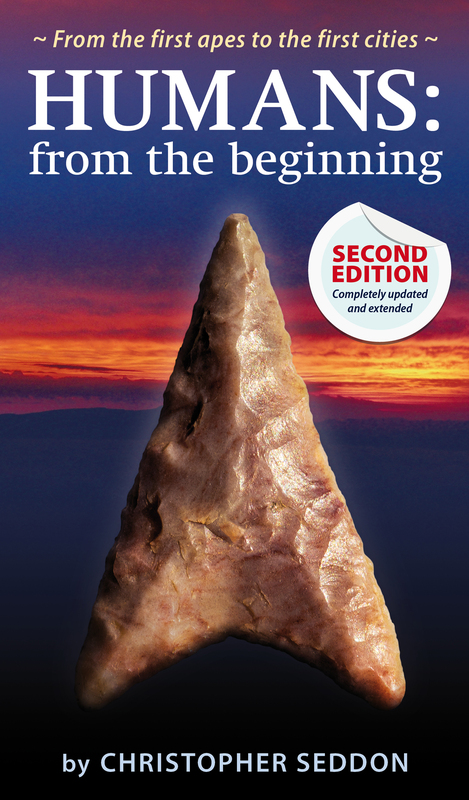 The book deals with the Mesolithic and Neolithic periods in Britain, although it does not name the former. Its description of the Mesolithic people, who arrived when Britain was still joined to mainland Europe, does not make comfortable reading. They were “covered in hair and had fierce animal-life faces”. They were “able to talk and think, though only in a very simple way”. They could make “some sort of clothes” but “had not yet learned how to build even the simplest houses”. On the other hand, it concedes that the cave paintings of their Upper Palaeolithic forbears in France were “amazingly well done”. Until around thirty years ago, it was widely believed that archaic humans such as Homo erectus and Neanderthals were early forms of Homo sapiens and that the species was perhaps two million years old. But behaviourally modern Homo sapiens was a much later development that arrived in a ‘human revolution’ 50,000 – 30,000 years ago. This was announced by the spectacular cave paintings and other artwork of Upper Palaeolithic Europe. We now know that both viewpoints are wrong: firstly, modern humans are a separate and comparatively recent species, albeit they could and did interbreed with archaic people. Secondly, modern humans were behaviourally modern at least 100,000 years ago, and probably much earlier. Upper Palaeolithic (and later Mesolithic) people had the needle and thread; and often invested considerable effort in building sophisticated dwellings. Admittedly not all of this was known in 1961, but the cave paintings have been known since the nineteenth century, and it is patently obvious that they were not the work of dimwits. Yet this nonsense continues with a description of the arrival of Neolithic people in Britain. The Neolithic people “were much more intelligent than the [Mesolithic] people who lived in caves… the cave man’s brain was underdeveloped, and he didn’t think very much. The Neolithic men had better brains…”. The date given, 7,000 – 6,000 years ago, is reasonably accurate, albeit the book incorrectly states that Britain was still connected to mainland Europe at this stage; in fact, Britain separated from Europe – the original Brexit – more than 8,000 years ago. We are then led to believe that a British Neolithic genius called Quick Foot decided he was fed up with living in caves and came up with the idea of building a hut. He then went on to single-handedly invent the Mode V microlithic tool tradition. Other early Brits invented the needle and thread, tailored clothing, line fishing, pottery, the use of flints to start fires, and (having originally walked to Britain) boats. To be fair, the author of the book, Lawrence du Garde Peach, was likely attempting to convey the importance of these things to children rather than start a myth that they were invented by Ancient Britons. The British Neolithic people are incorrectly described as having the ‘big four’ farm animals (cattle, pigs, sheep, and goats), but no crops. In fact, the first agriculturalists to reach Britain possessed a full mixed-farming economy of crops and animals. The book is to be credited for what must surely be the most simplistic (and entirely inaccurate) speculation ever to appear in print concerning the origins of cereal domestication. “Perhaps Quick Foot’s wife, or some other woman threw away some grass seeds beside the hut and noticed that they grew”. She then hit on the idea of growing some more seeds, cooking them with milk to make porridge, and then grinding them and cooking the resulting flour to make (unleavened) bread. “Everybody liked the new sort of food”. We then learn how villages and exchange networks grew up, and how cattle rustling became a problem, leading to the construction of fortified hilltop settlements, many of which can still be seen to this day. They do indeed, but they mainly date to the Iron Age, and none predate the Bronze Age. However, we do know that there was intercommunal violence in Neolithic Europe, with grim evidence of massacres, though the motives are unknown. Theft of livestock is certainly a possibility. In the remainder of the book, we learn about Neolithic monuments including Stonehenge, the construction of which is described in some detail, and is attributed to a “wise and powerful” paramount chief who intended it as a temple for sun-worship. The words “very primitive race” certainly jar, as does the implication that with a few exceptions, such as Quick Foot, Stone Age Britons weren’t very bright. “Stone Age Man in Britain” teaches us rather more about attitudes to gender and race in 1961 than it does about the prehistory of Britain. The gender stereotyping is blatant, with women relegated to sewing, making pots, and food preparation. Important discoveries would be made by ‘some man like Quickfoot’. Throughout the book, the term ‘man/men’ is used as a synonym for ‘people’ or ‘humans’. It was known that the Mesolithic and Neolithic people were modern rather than archaic humans. But the view was then widespread that some ‘races’ were simply smarter than others, and that people who live in traditional societies as hunter-gatherers or subsistence farmers must by their very nature be a bit dim. It was an era of casual racism: for example, children were taught a version of Eeny, meeny, miny, moe that featured the N-word; and blacks and Irish were openly discriminated against. We should therefore not be too harsh in judging a children’s book that was a product of its times. It’s not the Nou Camp or the Bernabeu – this is Victoria Park, the home of Hartlepool United FC since 1886. Founded in 1908 as Hartlepools United, the club originally represented the towns of West Hartlepool and Old Hartlepool. The name was changed to simply Hartlepool FC in 1967 when the two Hartlepools were merged into a single county borough; the ‘United’ was re-instated in 1977. By whatever name, it is fair to say that Hartlepool United have never set the footballing world alight. The club were founder members of League Division Three North in 1921 and to this day have never competed above the third tier of the English league system. During the era when the Football League was virtually a closed shop, the ‘Monkey Hangers’ set an unwanted record of having to apply for re-election fourteen times. Prior to 1986-87, there was no automatic promotion or relegation to or from the Football League, but the bottom four clubs had to seek re-election. Only occasionally would a member club be voted out in favour of a non-league hopeful. Hartlepool’s major claim to fame is to have been the first club managed by the legendary Brian Clough. Another manager who enjoyed success at Victoria Park was the former Spurs and England defender Cyril Knowles, whose life was cut tragically short by cancer at the age of 47, and who now has a stand named for him. As recently as 2013, Hartlepool United were playing League One football, but relegation that season ended their longest-ever period (six years) out of the bottom tier. Unfortunately, the decline continued and a second-from-bottom League Two finish in 2016-17 finally ended the club’s so often charmed life in the Football League. 1998 – before 9/11, before the financial crisis, before Brexit, before Trump. There is no doubt that Antony Gormley’s iconic sculpture was completed in times far more optimistic than the present day. Construction of the Angel took four years and cost £800,000. Its exposed location atop a hill meant it had to withstand winds of up to 160 km/hr (100 mph). It was therefore anchored to the underlying bedrock with 600 tonnes of concrete. The sculpture itself was built in three sections at Hartlepool and transported to Gateshead by road: the body weighs 100 tonnes and the wings each weigh 50 tonnes. The assembled sculpture is 20 metres (66 ft) tall, with the wings measuring 54 metres (177 ft) across. Sheffield-born Helen Sharman was the first British astronaut and the first woman to visit the Soviet Mir space station in May 1991. The space suit she used for the mission has gone on display at the Hancock Museum in Newcastle as part of the Great Exhibition of the North. Project Juno was a private initiative to send a Briton into space by purchasing a seat on a Soyuz mission to Mir. Helen Sharman, at the time employed by Mars as a chemist, was selected from nearly 13,000 who responded to an advertisement reading “Astronaut wanted. No experience necessary” which appeared in the British press in 1989 (other hopefuls included science fiction author Stephen Baxter). Sharman and her backup Tim Mace underwent training at the Yuri Gagarin Cosmonaut Training Centre, Moscow (“Star City”), but the Juno consortium failed to raise the necessary funds for the mission and it faced cancellation. It eventually went ahead thanks to the personal intervention of Soviet leader Mikhail Gorbachev. However, the ambitious microgravity experiments planned for the mission had to be substituted for simpler tasks that could be performed with existing equipment on the space station. Sharman was launched aboard Soyuz TM-12 on 18 May 1991, accompanying mission commander Anatoly Artsebarsky and engineer Sergei Krikalyov. She performed medical and agricultural tests, photographed the British Isles, and participated in a licensed amateur radio hookup with British schoolchildren. She returned aboard Soyuz TM-11 on 26 May 1991. Aged 27 years and 11 months at the time of her flight, she remains one of the youngest people ever to travel in space. The mission was one of the last to take place before the collapse of the Soviet Union. Both Helen Sharman and Tim Mace were candidates in the 1992 and 1998 European Space Agency selection rounds for its astronaut corps, but surprisingly neither were chosen. Helen Sharman was appointed an OBE in the 1992 Birthday Honours. She continued her scientific work and in 2015 she was appointed Operations Manager for the Department of Chemistry at Imperial College, London.